Tags: Autumn, blind hiker, Hiking, Inspiration, outdoors, Randy, winter. Group shot on Franconia Notch. Our rather epic adventure to summit the tallest standalone mountain in the world should become reality this year. We have assembled a team of 10 friends to climb Mt. Kilimanjaro in September 2015. 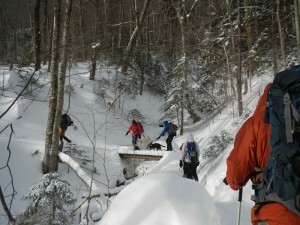 January 30 brought 8 of the team together for a practice hike in the frigid Franconia Notch. Originally we hoped the steady steeps of Mt. Lafayette would be excellent work and the views a worthy celebration, but as temperatures began to drop and wind speeds began to rise we adjusted plans to avoid the 2 miles above tree line in dangerous conditions. 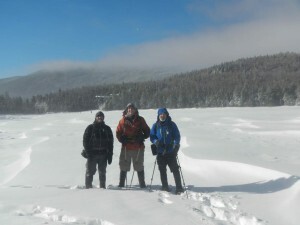 Hiking just across the notch Lonesome Lake trail and the Kinsman Mountains allowed for more sheltered work which would still have team building challenge and experience. As we assembled by the trailhead, the lowest temperature noted dropped all the way to -8 along with winds to make it more challenging still. This was below the range of our comfort and we expected the hike might be curtailed yet chose to at least work towards the well traveled trail up to the frozen tarn. Frost-covered Tracy takes the lead! Tracy took the lead quickly so we could begin keeping warm with the exertions, but many snow drifts quickly had her stopping to don her snowshoes. The long legs of Rob and Randy stayed with micro-spikes to the start of the tree-sheltered incline which made the trail more packed from the frequent daily trips to the AMC hut. 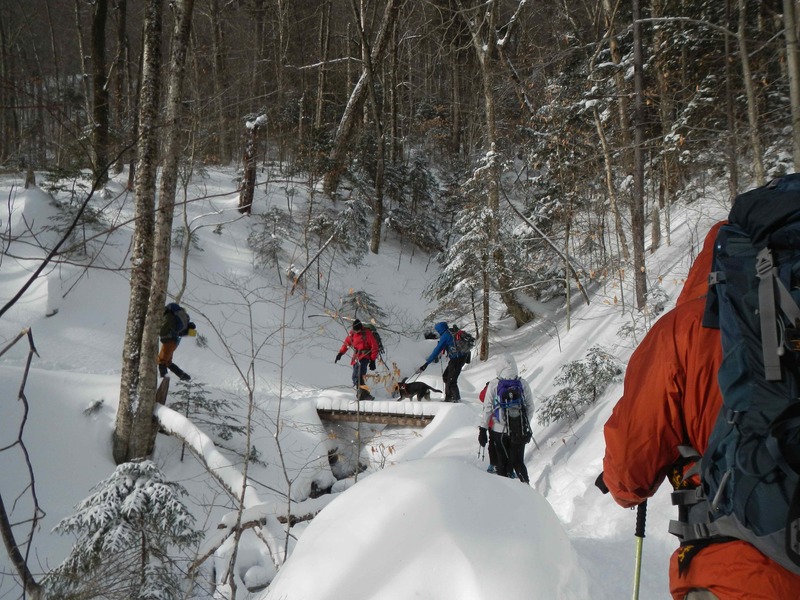 This also eased the worst of the wind chills and we all came together along the trail enjoying the beauty of the snowscape and mountain escape. Autumn guided me with enthusiasm to be working and moving. Pups and people were fine in motion but every stop brought a uncomfortable chill for both Dina and Autumn, the two dogs on the trip. Worse, Dina’s furry paws kept binding snowballs and neither her boots nor the musher’s wax seemed to be helping her. Rob and Randy cross the bridge. Thus just before reaching the lake, Michelle turned around and the group consensus suggested that Lonesome Lake would be our turn around point as well. Those few who braved the gusty Arctic chill of the winds on the lake did so mostly to appreciate temperatures well below what we are ever likely to experience during our African journey. We all then headed down with Autumn and me managing much of the down on our own, knowing we had Cat and Tracy ahead of us and the main crew of Rob, Greg, Frank, and Cathy not too far behind. It was a fun part of our trip to work the trail entirely on our own. Once caught up though Rob Webber took over guiding to help us make a faster return to the warmth below. 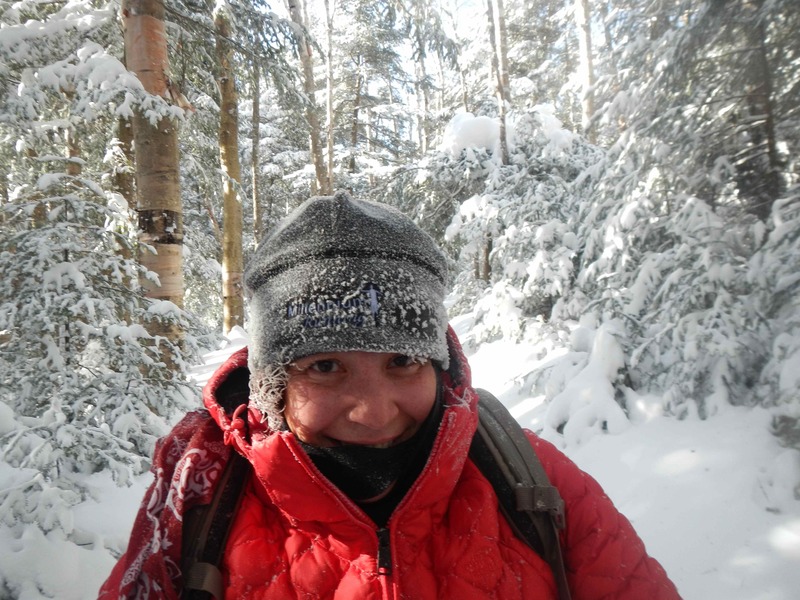 While vastly shortened as a hike, it allowed us to explore the group dynamic for making decisions and supporting each other in fairly difficult conditions. We spent the rest of the day together feasting, planning the final timing for our travel, Safari, and just having fun. Whether it was a teaser to some of the deeper questions and answers we may share on the trail or the laughter and competition of Catch Phrase, it was quickly apparent that the friendship held by some quickly led to a warm and welcoming friendship for all to share. It’s just over six months away, but it finally feels like the real beginning to our journey together has arrived. We’ve set the next date for a little hike and hang out work. I’m excited to bring the full team steadily together and make the dream a reality. Thank you to the entire Killy Team: Rob, Jose, Greg, Tracy, Michelle, Cathy, Frank, Maureen, and Cat!